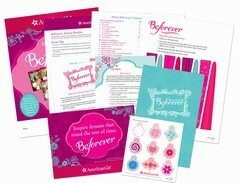 Draw customers to your store when you host an event inspired by the beloved world of BeForever™. This all-inclusive event kit features supplies, crafts, quizzes, and games for up to 30 girls to get acquainted with the BeForever characters—and with each other! There’s even a step-by-step planner for you to help make everything run smoothly. Qualifying order required. Available while supplies last.